Organizations undergoing digital transformations are dealing with amplified concerns around risk and security, which isn’t surprising. Ensuring visibility and accountability for compliance, security and governance while enabling flexibility for digital transformation requires a fresh and more tightly aligned approach to who—and now what in the form of applications, services, machines and things—are given the keys to the kingdom: privileged access. 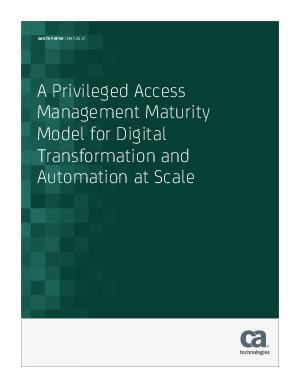 Read this white paper to understand how the digital transformation journey requires thinking through a clear roadmap that spans multiple years, anticipating near- and long-term requirements from a privileged access management solution and ensuring scope and scale needs at a reasonable cost of ownership through the entire lifecycle.